As the ball dropped out of the sky, the pint-sized player instantly killed it stone-dead. In the same movement, he spun past his marker, drawing gasps from the crowd as he hared off down the wing. 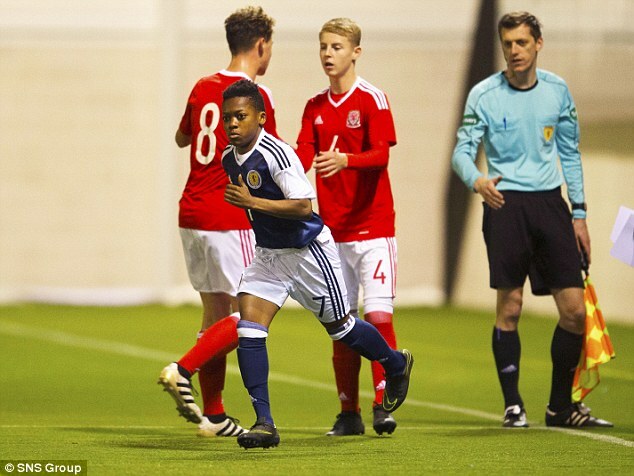 In that brief, electric moment, those who had been waiting patiently to see young Karamoko Dembele’s first appearance for Scotland were not disappointed. 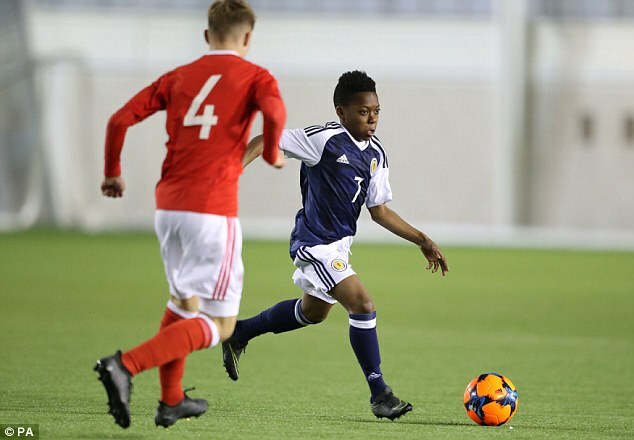 Dembele is the kid who, in this age of social media, suddenly exploded to the world’s attention when he was selected for Celtic’s Under-20s last month against Hearts at the tender age of 13. He had previously outshone the best Barcelona had to offer in being named player of the tournament at the prestigious St Kevin’s event in Ireland. 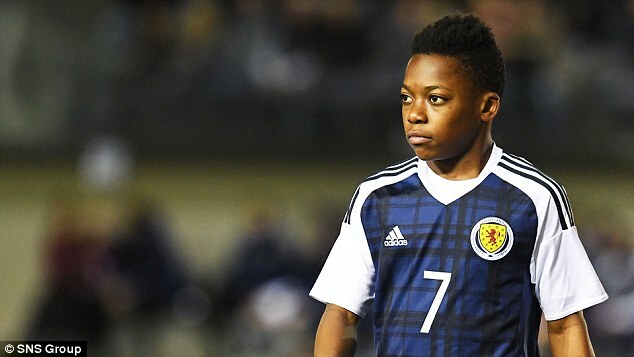 Called up to Scotland’s Victory Shield squad, England then invited Dembele down to train last week, with the player also being eligible to play for the Ivory Coast. Keen to wrap the player in cotton wool, Dembele was an unused substitute in Sunday’s 2-0 Victory Shield win over Northern Ireland. On Tuesday night, though, the time was right to field him against players a full three years older and he was given the nod after 54 minutes. And over the course of an impressive 26-minute cameo in this 2-2 draw with Wales, he lit up the second half with flashes of speed, skill and close control. He may be diminutive in stature but Dembele has a big talent and also a sizeable heart as he bravely showed for the ball. 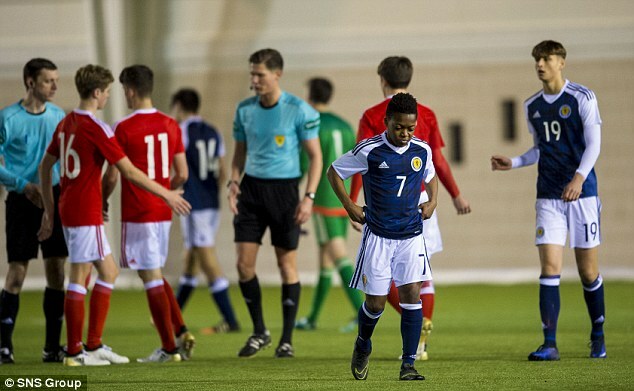 Afterwards, Scotland Under-16s coach Brian McLaughlin, himself a former Celtic winger, said he hoped this would be the first of many outings for Dembele in dark blue. ‘He was fantastic,’ said McLaughlin. 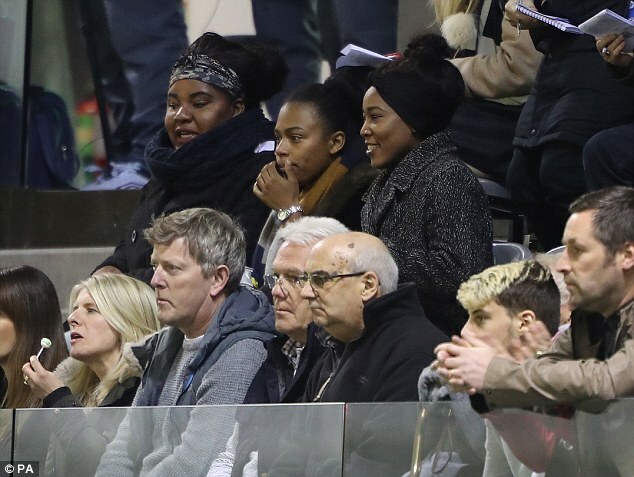 ‘You can’t get everyone on the pitch, which is a pity when their families are there to watch. But there were three players making their debuts tonight and Karamoko was a part of it. ‘He came on, he did well, he gave us a little bit of energy. He’s very, very brave on the ball and he loved the occasion. ‘Tonight just felt like the right time to bring the young man on. It was a great learning experience for him. In a slow-burner of a first half, the most excited the crowd got was when they sighted little Dembele warming up behind the goals with a series of stretches and high kicks. 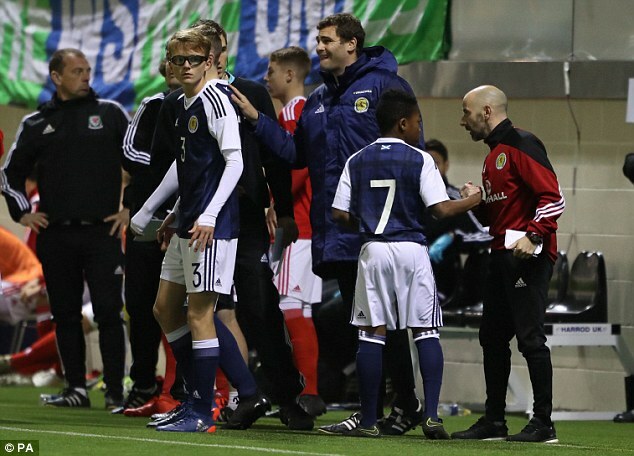 Scotland took the lead when highly-rated Rangers midfielder Billy Gilmour fed captain Chris Hamilton and he sent Zac Butterworth down the right. Butterworth’ s deep cross was headed home by Motherwell’s Jamie Semple, albeit with the aid of a huge deflection. Man of the match in the 2-0 win against Northern Ireland, Rangers kid Gilmour is interesting English Premier League clubs like Chelsea, Manchester United and Arsenal. And he showed why with a strong showing, being denied a goal when his thumping shot cannoned off the post. In addition to Dembele and Gilmour, captain Chris Hamilton of Hearts was very impressive. As was Wales captain Terry Taylor, an Aberdonian who qualifies for the Welsh through his Mum. 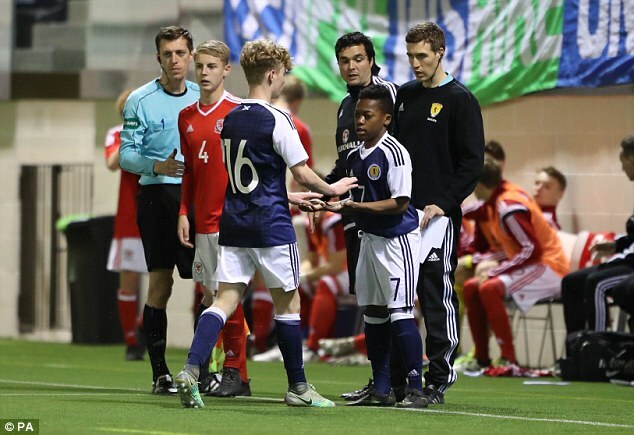 Taylor made his own Dons Under-20 debut at the age of 14 against Kilmarnock but with none of the fanfare that greeted Dembele’s breakthrough. But it was Motherwell forward Semple who stole the limelight with a fantastic second on 32 minutes. He met a Kane O’Connor cross and fired the ball with the outside of his left foot into the far corner. 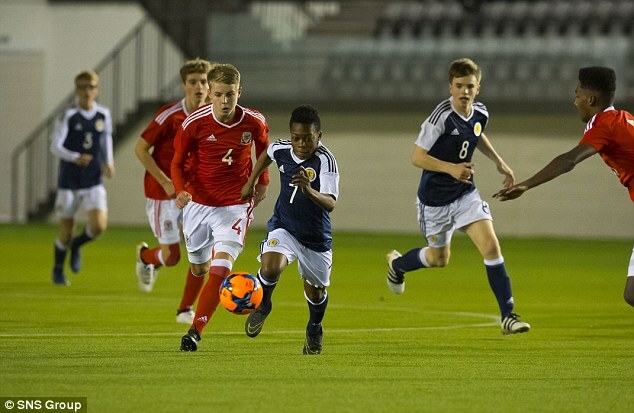 Three minutes after the break, Isaak Davies pulled one back for the Welsh when he tapped in at the back post. Semple then missed out on a hat-trick when he headed off the bar. And after Dembele’s introduction, Keenan Patten secured the draw with a quite exquisite shot from the edge of the box.